A few thoughts on the Liverpool 0-2 Arsenal league match | "It's all about the Arsenal"
After all the gloom surrounding transfer deadline day and lack of transfer activity at Arsenal, it was nice to be able to sit and watch the Arsenal live on TV away to Liverpool… The amount of stick the club have been getting the lads needed a performance to get certain sections of the supporters back onside and get the circling buzzards of what I feel is a very poor lot of football journalists in today’s media off the clubs and teams back… Two games with zero goals is highlighted and yet two games with no goals conceded mainly overlooked. Don’t want it to get in the way of a good story. No sign of the same sort of intense scrutiny aimed at Spurs or Liverpool. Playing at the ground that gave me my greatest moment in my 50 years as an Arsenal football fan in 1989, when I travelled in a stretch Limo with six mates to see us beat the bindippers against all the odds 2-0. The team : Mannone, Jenkinson, Mertesacker, Vermaelen, Gibbs, Diaby, Arteta, Oxlade-Chamberlain, Cazorla, Podolski, Giroud. Subs: Martinez, Koscielny, Andre Santos, Walcott, Ramsey, Coquelin, Gervinho. Early sparring has both sides knocking the ball around yet going nowhere, often given the ball away cheaply, until Borini has a 25 yard speculative shot that goes wide. Suarez is then in a chase with the BFG and referee Webb deems it a foul, fair enough, However, Webb can’t wait to book him and I could not see how that was a booking, Justice as the diver shoots well high over the bar. Borini has another chance and puts it wide, the usual early pressure building from Liverpool. Good bit of work by Cazorla the little Spanish magician yet his shot is half hit and rolls along the ground to Reina in-goal. Stevie Me’s corner see Agger free only to completely miss. The game is a bit flat at the moment and that suits Arsenal as they start to take charge. Sloopy from the BFG as he gives the ball away and puts Arteta in danger and the Spaniard takes a booking for the team. Sterling hits the post with a good turn and then goes down in the area. The screams from the bindippers on the terraces were loud, but Webb (shock) says no and stands firm, it was never a penalty, but an excellent tackle from the BFG. Nice back heel and turn by Podolski and lays the ball to Diaby who skips past Johnson with ease, then powers through the midfield, bossing it, runs directly to the edge of the area and slides a neat little Cazorla type pass into Giroud who somehow misses like against Sunderland at home, however, he does not hide and if he keeps getting in the positions the goals will come. Half time 1-0 to Arsenal and good a player as he is, Suarez is a cheat pure and simple. always diving, asking for fouls and holding his arms up in the hope the ref will give him decisions. The thing I find irksome is the commentators who seem to somehow find any excuse not to use the words dive and cheating. Arsenal have played well and looked strong and don’t look like making to many mistakes which is a big improvement on last season, more so if it continues. Keep the game tight, break fast and there is three points in the bag here… Looking forward to 2nd half. Teams come out and no changes for Arsenal. Straight away Skrtel is booked for a tackle on Diaby from behind. Thankfully Diaby gets up, dusts himself down and gets on with game. The diver now goes down in the area again under pressure from the BFG and again Webb says no.. Suarez does help himself how he goes down by flinging his arms out and making it look such an obvious dive. Liverpool take off Borini and bring on Downing, so that’s them down to 10 men. Screams again from the hoards of bindippers as TV5 falls over and the ball and hand meet, never intentional and correct decision. Their cries are getting desperate now. Oxo who has been lively looks to have cramp and is replaced by Ramsey. With Arsenal in control of the game and not looking in any danger, Podolski is replaced by Santos. Arsenal corner, their first, sees Cazorla flight it right onto Giroud’s head and he heads over, good chance to open his account and maybe should have. Keep getting in those positions mate, the goals will come. Shelvey with a nice bit of footwork shoots low and hard and Mannone playing well and looking confident save only for the ball to spin loose. TV5 showing true hard grit and leadership, dives in and clears the ball from Stevie me who was lurking and surely would have scored. Great defending. Another cracking shot from Shelvey and Mannone is there with a good save. Early days but have we found a No.2? Final whistle and 0-2 to the Arsenal. Excellent display from the lads. never looked in danger save giving some cheap balls away early and late on, but never in danger. The team all working hard for each other and the defence looking very solid. Apart from the early and late sloppy passing, over the it was getting back to the nice crisp passing that we are used to see from Wenger’s teams. Early days but all it is looking promising. Jenkinson did well after a couple of early mis-kicks. Gibbs looked very good, save his crossing, but he does look to be paying much more attention to his defending. BFG and TV5 looked a good partnership. Arteta looks the boss in front of the back four. Cazorla always dangerous with his passing. Diaby was awesome in midfield and not looking like Ya Ya Toure but more like PV4 who was a much better player. 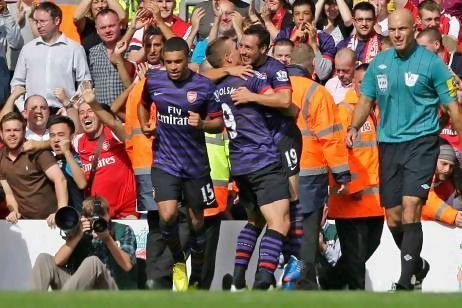 Podolski working so hard and so was the Ox. Suddenly it’s looking promising. Let’s remember this mob gave City a run for their money last week. I almost felt for the bindippers on the terraces as the camera zoomed in on them. Their club has been ripped apart for the last 6/7 years. Stevie G is way past his best as age and injuries catch up on him. Relied on a past idol (Dalglish) to turn things around, yet just spent, spent, spent on players who were never worth the money. They only paid £35m for Carroll due the £50m they got for Torres. Had Wenger got £50m for Cesc and enquired about Carroll and was told the fee would be £35m he would have hit the deck laughing and put the phone down. Downing, Adams and Henderson, just who signs the cheques at Liverpool? Now they rely on a manager who has one half decent season at Swansea in the Premiership. The thing is Arsenal won’t go down this road and yet still get poor media views for how they run the club. It would seem Liverpool are untouchable in the media. Always bloody great to see Arsenal win and not many better than at Anfield where even though Liverpool aren’t the force they were, great to take three points there. Big shout to the travelling Gooners. We could hear you loud and clear and gave the team great support. Some great humour in the songs as well. Final whistle and 0-2 to the Arsenal. Excellent display from the lads. never looked in danger save giving some cheap balls away early and late on, but never in danger. The team all working hard for each other and the defence looking very solid. Apart from the early and late sloppy passing, over the it was getting back to the nice crisp passing that we are used to see from Wenger’s teams. Early days but all it is looking promising. Jenkinson did well after a couple of early mis-kicks. Gibbs looked very good, save his crossing, but he does look to be paying much more attention to his defending. BFG and TV5 looked a good partnership. Arteta looks the boss in front of the back four. What was also nice to see was the players clearing their lines with the row Z punt when needed, rather than play the ball out and cause ourselves problems in the last few minutes. Also I do feel at time when teams are coming onto us over the last few years when we do have the chance to break and settle the match with another goal, we always seem to choose the wrong option. Cazorla always dangerous with his passing. Diaby was awesome in midfield and not looking like Ya Ya Toure but more like PV4 who was a much better player. 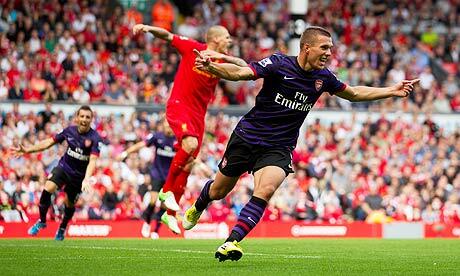 Podolski working so hard and so was the Ox. Suddenly it’s looking promising. Let’s remember this mob gave City a run for their money last week. ← Deadline day. How it happened, or didn’t in AFC’s case. thanks for positive review – could it be this man Wenger knows what he is doing? ?